BBQ Chicken Wings, Mee Goreng Mamak, Satay, Char Kway Teow and Chicken Tandoori are some popular hawker food to savour at Terazza Brasserie’s newly launched Hawker Fare theme buffet. An integral part of Malaysia’s food scene, a selection of those familiar favourites from itinerant hawkers can now be enjoyed in the comfort of Dorsett Grand Subang’s all day dining restaurant every Wednesday night. The sneak preview saw us relishing hot off the grill BBQ Chicken Wings from one of the six pop-up stalls set outside the patio area. Served with a sweetish Thai-style chilli sauce, the tender wings hit the spot and whetted our appetite for more. 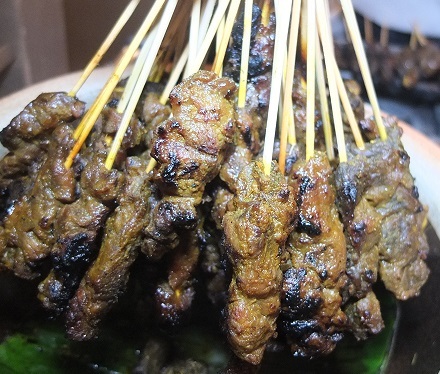 Satay – the compelling party food of choice – is also part of the line-up and you can tell how good the grilled skewers of chicken and beef are at the rate they disappear from the chafing dish. No worries though as the culinary team ensures there are plenty to go around. I could never resist delicious Tandoori Chicken and the version here lived up to expectations. Served with cucumber raita and fresh lime wedges, I thoroughly savoured every mouthful of the moist, juicy meat. A posher spin of this is Lamb Tandoori with Cucumber Chutney. Well suffused with aromatic Indian spices, the thick cutlets proved equally delectable. Carb-loading comes easy with substantial servings of piping hot Mee Goreng Mamak or you can head outside to the stalls for Char Kway Teow which is cooked to order. Both came up to scratch and left us no cause for complaints. For some green balance to your meal, rustle up a Caesar salad at the buffet where all the condiments and ingredients are laid out. The various appetisers and assorted local kerabu salads presented on multi-tier stands also proved irresistible. Poached Seafood on Ice: Prawns, Mussels and Oysters should reel seafood-living diners in. Enjoy them with some Thousand Island dressing or keep your eyes peeled for cooked main dishes such as Prawns with Thai Mango Salsa and Stuffed Seafood Tortilla. I found the piquantly flavoured Squid Salad particularly appealing. If you think no meal is complete without a bowl of heartwarming soup, the hearty Oxtail Soup has the comforting factor down pat. Fragrant with herbs and spices, the rich, wholesome broth with chunks of gristly bones, carrot and oxtail embraced the mild sweetness of fried shallot and the fresh accent of chopped coriander in it. The beauty of buffet is food choices are aplenty and there’s always something to please every palate. Apart from the myriad of Hawker Fare served, you’d find other worthy options to sample – just look at our plate as proof. Local dessert taking centrestage comes in the form of Air Batu Campur (ABC), Assorted Malay Kuih, Indonesian Layer Cake and sweet broth like Bubur Cha Cha and Pengat Durian. Available on every Wednesday night, the Hawker Fare buffet is priced at RM118 nett per adult and RM59 per child (above 5 years old). Senior citizens are entitled to 50% off the full price.